Try to avoid running in low-light conditions. You'd be surprised at how easy it is to trip over a large stone and find yourself with a knee injury for a month! Alternatively, if you find thinking about solo running and safety tips to be one big headache, partner up with someone and run with a friend! Motivation, conversation and company. What's not to like?! Okay, so, say hello to my new favourite activewear set! Not only is the tropical print completely fitting with the waves of heat the UK is experiencing this summer, but the fit is also beyond dreamy. The sports bra includes removable cups, meaning you can workout and keep your chest. Magic, I know. Also, gotta confess to having a soft spot for short shorts! 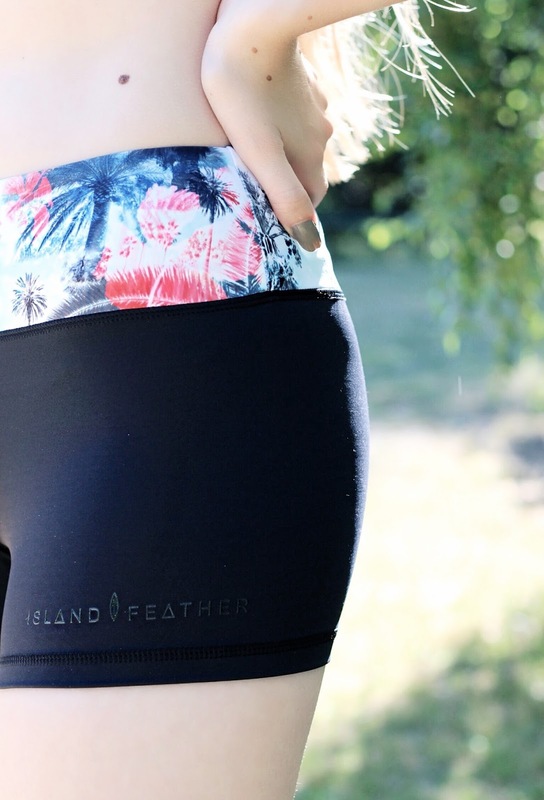 Island Feather's training shorts combine flexible lightweight technology with a flatteringly thick waistband; which makes keeping active aaaall the more fun! Do you have any other tips for keeping safe while solo running? 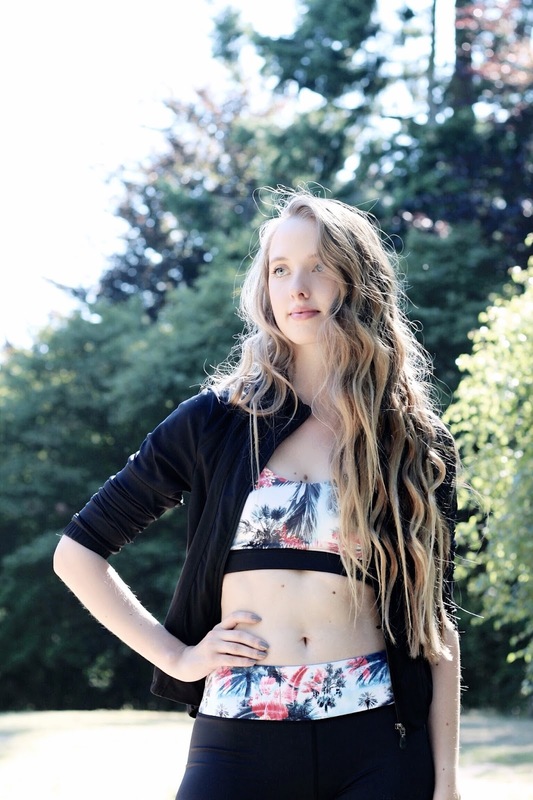 And I'd love to hear your thoughts on this tropical-printed activewear set from Island Feather! I always find that wearing awesome gym clothes motivates me more to train. I love the theme of your post, especially how you mentioned to alternate your running route. I think that is one that people forget, granted I exercise in a boot camp, not by running. But they say joggers can be put at risk of an attack, especially if they run a specific route someone could notice and then stalk the individual by that route they take. Granted I've watched far too many episodes of criminal minds haha. Lovely post! I love the photos you take. Cute workout gear is such an awesome way to get motivated to get out and exercise. This set is so pretty and perfect for summer and running is such a terrific way to stay fit and be outdoors. I really want to get back into it if I can ever stop messing up my ankle. For now I'm just sticking with yoga and pilates. I'm really not much of a runner, but if I do, it's alone. These tips are helpful! It skips my mind to tell anyone when I leave. I should probably remember that! I really need to start running again, I love how I feel so healthy after! Great tips! You hear so many horror stories of people running outside these days! I never have my music all the way up so I completely agree with you on that one! I think it’s probably the most important point. & there’s nothing like some stylish workout gear to get you motivated! Not exactly solo running, but I used to take our dog with me for runs in more lonely places. Made me feel safe and her walk was seen to as well. Thanks for the tips! I love that leaf print! It's so cute! Awesome gym clothes for some reason makes you feel better and encourages you to exercise. Great read and thanks for the tips! This is a gorgeous fitness outfit, love the print and style. You look lovely and very fit dear. Great tips! I also bring my dog with me and pepper spray. You just never know. Love your workout gear!!! Love this look! Seems like lovely pieces to run in. Thanks so much for the tips, I've just started running so this is really helpful! You look really beautiful with sportive clothes! Have a lovely weekend Gab! Firstly can we talk about how amazing you look in this set? The set itself is gorgeous too, I love the print. I always take my phone and I tend to stick to routes where I know there'll be people/houses too! Ohmygoodness that set is completely gorgeous, you look amazing! When I go running I'm gasping and sweating and these photos are just so flawless! I've never thought about getting a steel water bottle in case of defence, but that's an insanely good tip. The removable cups in the top also sound perfect, I don't want to be completely flat ever haha. These are some great safety running tips! I'm not a runner myself by my boyfriend is and often get a bit nervous when he goes out at night! What a gorgeous kit too - exercise is always much better when you get to wear something pretty! A good set of workout clothes is a must! I love these on you and I love it when they're so secure too! I am so glad you have included taking ID, a phone and telling someone where you are going in this post! That is a really great topic! Safety should be on everyones minds all the time! Great post and I love this workout outfit to! what a cute work out set! You sure look stunning while running:)...I do agree with that often cited thing- that a nice sporty outfit makes us more motivated to work out. This workout outfit looks perfect on you! I love going for a run by myself and I'm doing all what you said :) Thanks for sharing! Your workout gear is so cute! I love it! Good points about safety too - it's sad we have to do it, but so important to make sure people know where we are and when we are due back. And if possible, run where there are people just to be safe. Love your outfit, dear. You're fabulous! And that running gear is just... amazing! Love the print so much! Wow, love your sportswear! It's so hard for me to find someone to accompany me when I run so all these tips really come in time! Gonna restart my run schedule this coming week! I love the idea of the water bottle being stainless steel, that's such a good idea. You look absolutely gorgeous though, love this set and your figure is stunning! That tropical activewear set is just so beautiful!!! Love it!!! I’m not a runner but I always worry about women running, the world can be a dangerous place so these tips are helpful. I love your exercise outfit. You look adorable. Great tips! This is inspiring. this is super important my dear. You look fantastic, btw!! This set looks absolutely gorgeous, I love the print! Also, you gave great advice. I'm not one for running as I prefer home workout routines, but these are really important to keep in mind. Always tell someone you're going out running - it's sad to say that we have to take these precautions, but we're better off doing that, especially if the area isn't exactly safe! Those tips are so useful!! I never thought about informing someone about the route! Thanks a lot dear and such a pretty outfit!! *-* You're amazing! Totally agree on everything you wrote Gabrielle! You look wonderful, dear, sporty but very chic! Thanks so much for these tips! I much prefer running with someone else but that rarely happens so I always make sure to let someone know before I leave the house!! Your new activewear is really cute Gabrielle. I love the safety tips you offered. I have to workout to music as well. It really helps. Just converted to a steel bottle...Swell is the company. These are great tips! I totally agree with you especially with the inform part because there are dangerous people out there, but sometimes sh** just happens like getting a cramp leg, it's great someone knows your route and know where to find you just in case your not back on time :) BTW very cute running outfit! I'm not a runner but on the off chance that I do go for a solo run, I need to have music! I just get ridiculously bored if I can't run to a beat or something. (PS, I am loving your wavy hair here!). I love your running outfit! And it's so important to stay safe when you're running alone! Great post idea! Very relevant to me! Loving running at the moment and doing a lot of it. Adore active wear also, find myself buying more of it recently than any other clothes. 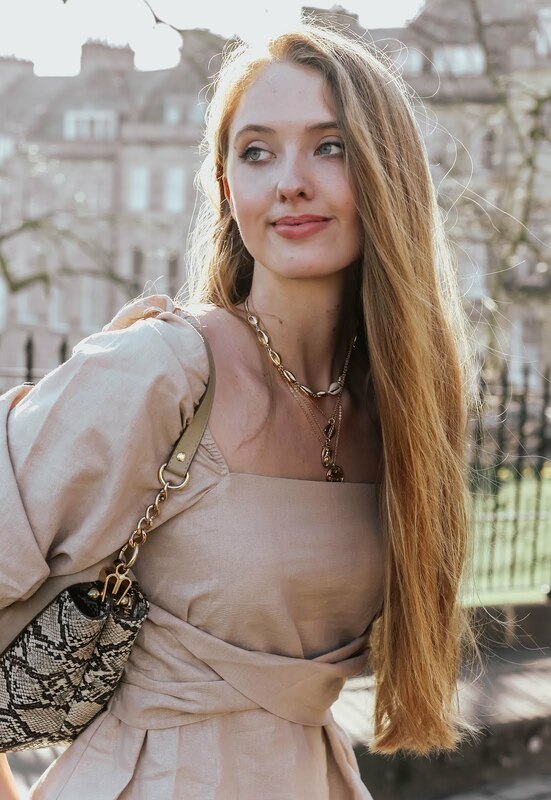 Looking so beautiful here, absolutely gorgeous print...and I want your hair!! Such unique print for a sports wear and u look stunning your figure is amazing HOW U STAY SO SLIM!!!! Great workout outfit. I think people should run with others. These are good tips though.